Shell Sectional Map No. 9 - Northwestern States. Map of Lewis and Clark's Track, Across the Western Portion of North America . 136-37. Mont., N.D., S.D., Wyo., Neb. 1 : 4800000 Colton, G.W. Nebraska, Dakota, Idaho, Montana, and Wyoming. 1 : 3400000 Johnson, A.J. 1 : 4942080 Johnson, A.J. (U.S. Northwest) Railroad Map of the United States. 1 : 3850000 Colton, J. H.
U.S. West of Mississippi R. 2. Vereinigte Staaten Von Nord-Amerika In 6 Blattern, Bl. 2. 1 : 4752000 Lea, I.
St. Paul, Minneapolis & Manitoba Ry. 1 : 1531600 St. Paul, Minneapolis & Manitoba Railway Company. Nebraska, and the territories of Dakota, Idaho, Montana and Wyoming. Colorado. Idaho, Montana, and Wyoming. Colorado, Idaho, Montana, and Wyoming. A Map of the British Empire in America. (Sheet 5). Map Of The Yellowstone And Missouri Rivers. 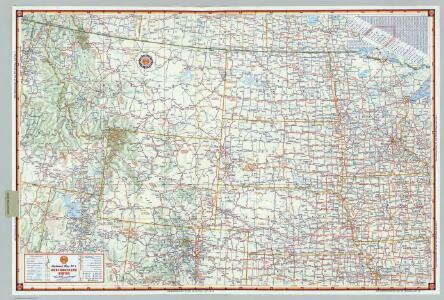 1 : 1200000 Raynolds, William F.
Road map Idaho, Mont., Wyo. State of Kansas, and Nebraska and Indian Territories.